Just because you’re new to one design racing doesn’t mean you can’t be successful. J/111 Worlds runner-up Jim Connelly tells us how he took his program from zero to success at the Worlds. It all came together - Slush Fund's hard work paid off and everything came together to put them on the podium. Photo by Gerard Sheridan - www.gerardsheridan.com. The 2017 J/111 World Championship in San Francisco ended with a mere two points separating the podium winners. Standing proud in second place, just one point off the champion, was Jim Connelly and the new J/111 one design Slush Fund team. Yes, you read that right, a new team. After a season of local races, the team decided to campaign to the Worlds. Connelly knew it was going to take a lot of work, but with the right amount of help, gear, and dedication, he knew they could at least be competitive. Many elements of Connelly and team’s success can be applied to other teams. Quantum: Congratulations on your 2017 J/111 Worlds finish. You must be happy. Jim Connelly: Thank you. Words can’t express how happy I am with how we performed in San Francisco. It was an amazing experience, beyond my expectations. Q: This was your first major one design regatta--a world championship no less--and you finished second overall, just one point short of first. Tell us how you prepared for the event. C: It started last year after the Annapolis Yacht Club Fall Series. We finished well around the marks and knew the boat had good speed. This was one of the first races Jason Currie from Quantum Sails raced with us, and we knew something special was going to evolve with the program. We thought there was a good opportunity to compete at Worlds, but we also knew we had a lot of work to get ready. Over the winter, my boat captain Sean Harr worked on refining different areas of the boat. 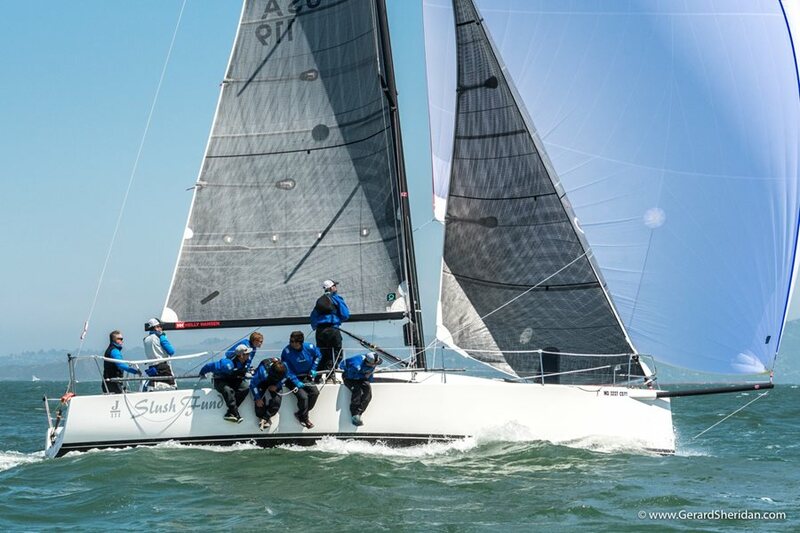 Since I am still new to racing, we also chartered a J/22 from Annapolis Yacht Club for the Frostbite Series as a way to get more experience with starts and driving. We entertained taking Slush Fund to the Midwest races, but decided it might not give us enough sailing time during the later spring and summer. Instead, we entered the boat in every race possible on the Chesapeake, including WNR, until it had to be shipped to San Francisco. We also had multiple practice days with a coach and with J/80s from J/World. Q: You had a very good team, including onshore support. Tell us about the team and how long you have sailed the J/111 together. C: We had an amazing team, but, interestingly, only a few members are regulars on the boat. Harry Scott, Ridgely MacKenzie, Tyler Raven, and Andy Elder have been on the boat on a random basis since the summer of 2016. College of Charleston student/sailors Liam Harr and Will Hundahl have sailed with us a couple of times but have great J/111 sailing experience. Jason Currie pulled together and rounded out the team by covering both tactics and trimming main, not to mention “guiding” me on driving the boat. Sean Harr also called tactics and trimmed main when Jason wasn’t on the boat and provided amazing onshore and chase boat support. Sean has been the key to our success by managing the boat and program since June of 2016. 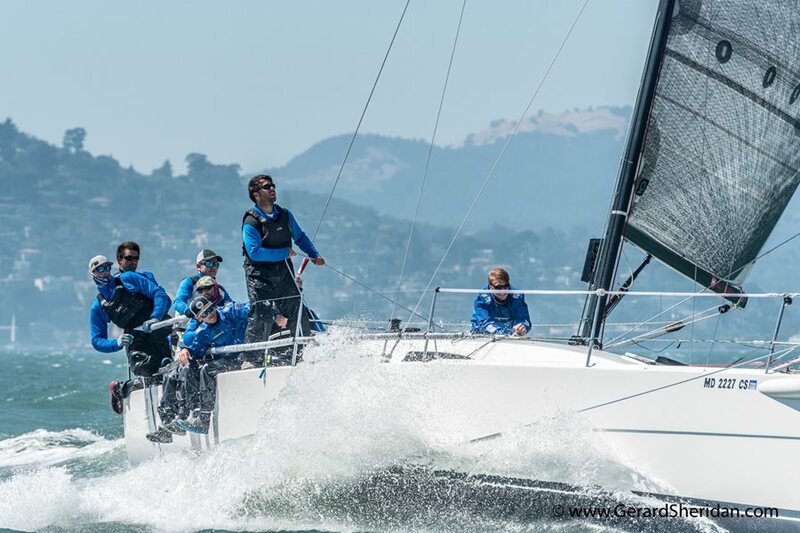 Q: It is interesting that an Annapolis team that sails mostly in light air arrived in San Francisco for a windy regatta and had a great event. How did you do it? C: We were concerned about the high winds. Since we didn’t compete in the pre-regatta, we didn’t know how well we would adjust to the high winds. When we landed in San Francisco on the Monday before the event, we went straight to the boat and got out on the water. We made some adjustments and refinements Monday, Tuesday, and Wednesday, but by race day the team was dialed in and acclimated to the winds. Several of the crew had sailed before in San Francisco and knew what to expect and how to handle big breeze. And on the Chesapeake Bay this year, we had some days of strong breeze during the NOOD, Boomerang, and Screwpile events that helped prepare us for San Francisco. Q: You must have learned a lot from this championship. What was the big takeaway for you? C: I did learn a lot competing in the Worlds, and the learning opportunity is one of the reasons you have to put yourself in these types of situations. My big takeaway was the need to consistently execute maneuvers. From my perspective, that was how the Skeleton Key team won the Worlds. They consistently executed throughout the entire regatta, which shows they spent time together training. That’s what we will work on going forward. Q: What advice would you give a J/111 owner who wants to compete at this level? C: Hire a good boat captain who knows the best practices, will get the boat up to speed, and manage the program/training and logistics. Align with a pro and sail loft that supplies the right product and talent for the boat. You quickly learn that it takes a lot of commitment and resources to activate a J/111. Q: What’s next, and what are your plans with the J/111? C: We’re going to keep sailing the boat in the Annapolis area this fall and next spring. As for 2018, we’ll likely do the same as we did this year with a focus on the J/111 Nationals in Michigan. The key is to continue refining the program and have fun! Click here to view information about the 2017 J/111 World Championship, including a full list of results. If you're interested in the J/111 class, click here to learn more and find an expert.